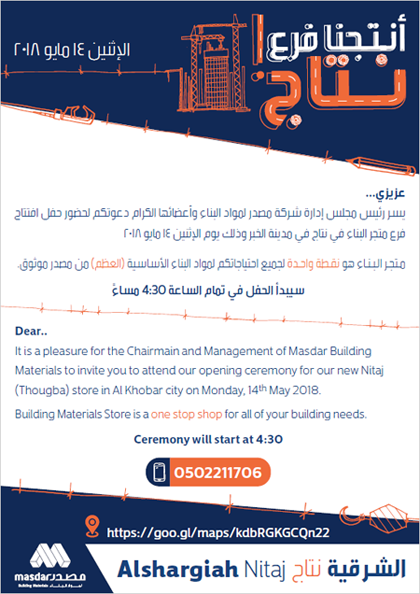 Home/Subsidiaries/Masdar Technical Supplies Trading Co./Abdul Wahab Kutbi and Brothers Co. The company grew up over the years with a track record of success and impressive achievements in its commercial business. Today it possesses a network of 9 showrooms supported with 12 warehouse of total space of 20,000.00 sqm around the kingdom. Of which can accommodate more than 28,000.00 products with different types and standards, and other customized products upon customers’ requests. Therefore, if you are looking for various fittings to your project, be assured that your choice will be the fittings supplied by Abdul Wahab Kutbi & Brothers Company Limited, of which can provide and supply for strong fittings that are durable. For more than 53 years the company worked hard to introduce products with high quality, especially for clients that are looking for high solid and strong products.